John A. Dix (1798-1879), Soldier, Lawyer, Statesman. An active career in military and politics, he became Secretary of the Treasury in 1861, his chief service to the Union. His dispatch of Jan. 29, 1861 to a treasury official in New Orleans which ended: "If anyone attempts to haul down the American flag, shoot him on the spot!" was a clarion call to the North. After turning over the job to Salmon P. Chase, he was made a major-general. After the war, served as Minister to France and Governor of NY. 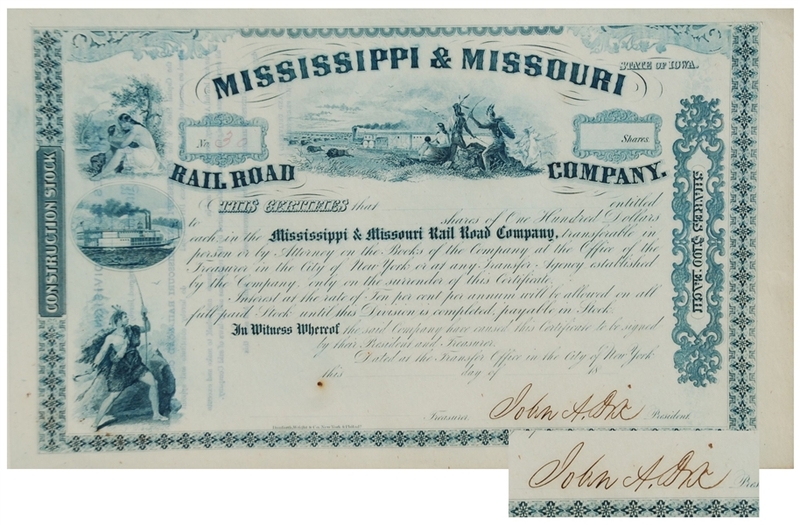 Gorgeous stock dated 1850's of the Mississippi & Missouri Railroad. Exceptional Southern stock. Nice signature no holes, excellent condition.